Sunday the Mr and I decided to go on a hunt for a new mattress, as despite being only 2 years old our current one isn't very comfortable. This resulted in us buying new carpet, a TV bed, pillows and a new mattress and we looked at new beds for the Mini Mes too.... Oops - but worth it! Monday we went on a bike and scooter ride after school for some outdoor fun and fresh air. Minxy has a basket on her bike which was handy for bringing back a few bits of shopping in too. We didn't get out as much this week as I would have liked but with it being half term now we will be outdoors a lot next week. Tuesday Spartan decided to join in with my 30 day shred by climbing on me during sit ups! 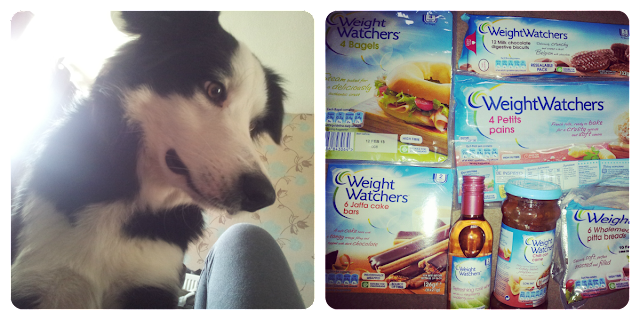 Wednesday I received a lovely Weight Watchers hamper of goodies including wine, bonus. Thursday Minxy had her first swimming lesson in the evening. She loved it and did really well, the instructor said she was confident which was reassuring as I have a phobia of water. Friday after a busy evening clearing our bedroom out completely ready for the new carpet I popped on a movie and poured the Mr a Jack Daniels Single Malt to relax. 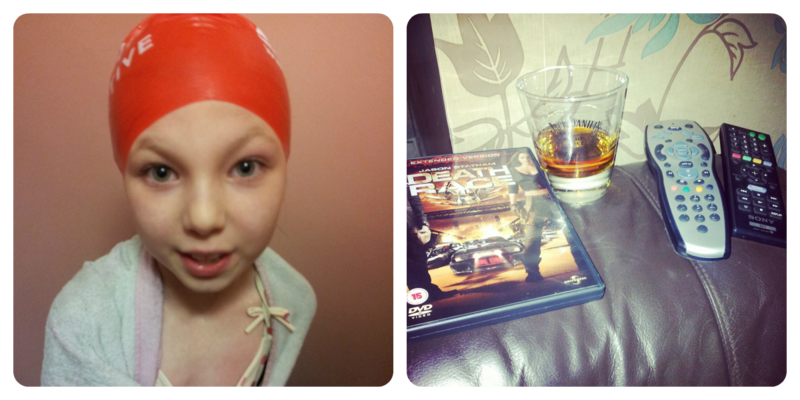 Saturday As the Mini Mes were really good while the workmen were in today, I treated them to some chocolate eggs, pizza and a movie. Looks like a fun week. Good luck with the 30 day shred! 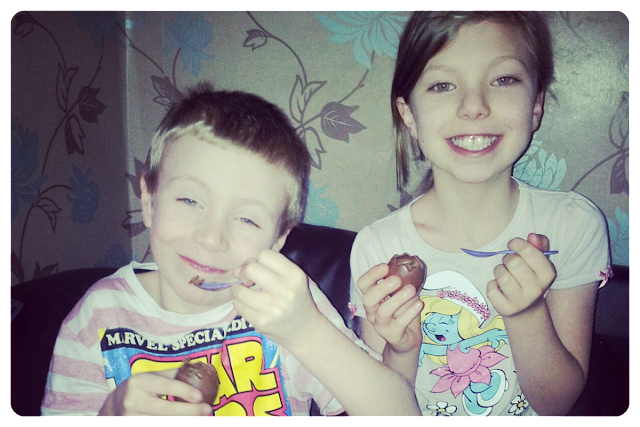 Great pics, I love those choccie eggs, very lucky mini mes! well done with the shred - i havent done it since thurs because i have really hurt my knee/leg and can hardly out any weight on it :( i think if still same tomorrow i will do ab work instead for now until it heals. fantastic pictures, looks like a busy week. I loved the pictures of the the bed it looks cool! There aren't many people who rock a swimming cap, but your daughter looks beautiful in one. My girls would love a bed like that! Oh for a house with bigger bedrooms! I had to google tv beds because I didn't know what they were and wow....I want one!! Great photos...I now want cadbury eggs and spoons! Loving the drunk on chocolate faces!! That sounds like an expensive shopping expedition. Well done on the hamper - should help out with your 30 day shred. Sounds like an eventful week! Good luck with the 30 day shred. Glad her swimming lesson went well. Do you think you will try and get over your phobia? Looks like you've had a busy week. Glad your daughter is doing well with her swimming, I don't like water either and always worry about passing the fear onto my two as they get older. Good luck with the 30 day shred, are you blogging about it? I'm in two minds about whether to try it or not! That bed is so cool, I would love one of those.